Ready to leave your wallet at home and use only your smartphone to perform all your everyday financial transactions? This is possible with mobile payments, which may actually someday replace most physical payment types like cash and cards. Be aware that some mobile payment services charge fees for transactions. Most are actually free but remember to research the websites mentioned below to be aware of their most recent policies regarding transaction fees. There are a variety of mobile payment systems that all work a bit differently. Some might require your phone to be near the other device receiving the payment, like with near-field communication (NFC) payments, while others just use the internet. Everyday transactions: One type of mobile payment takes place anywhere you are, like at home. You can open an app on your phone and pay anyone for any reason you wish: split a bill, send a money gift, refund someone for something they did for you, and so on. Money is usually taken straight from your bank account, but some services let you hold the cash in a "mobile wallet" for quicker transfers. Point of sale (POS) payments: These take place at the place where you're buying the service or good. Lots of stores have POS mobile payment systems in place that make it super easy to just tap your phone on the card reader or press a button on your phone to instantly pay the bill. Closed-loop mobile payments: These types of mobile payments are specific to a company. For example, Starbucks lets you buy anything from their menu using your phone, and you can even skip the line in the store and go directly to a mobile-order-specific line to quickly pick up your order. Carrier payments: Since every mobile payment–capable phone uses a cell phone carrier, some services are in place that let you pay for items from your phone but not actually have to pay until you get your cell phone bill. These are sometimes seen with donations you can make over text. Mobile card reader: Some companies offer a small device that plugs into your phone or tablet that can be used to accept payments from a debit or credit card. These are perfect for small businesses or even individuals who are accepting payments on the go. Mobile payments apps are being released on the major app store platforms all the time. The payment method is becoming so popular that some phones even have a mobile payment feature built right into the device. 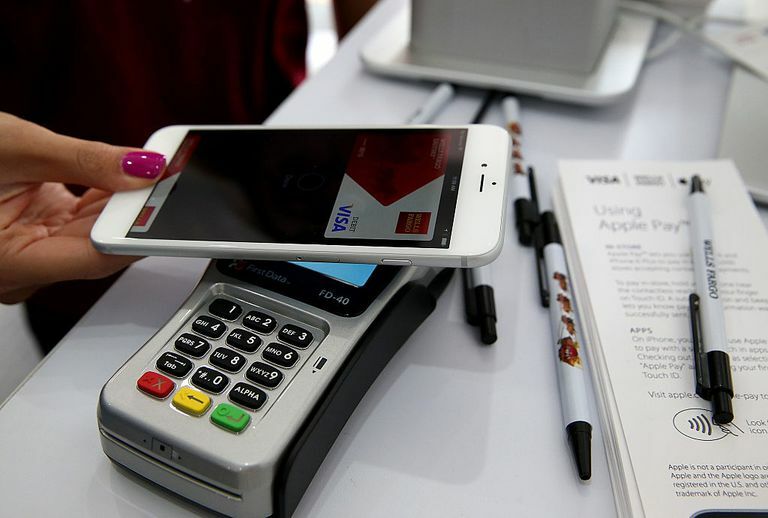 Apple Pay works with iPhone, iPad, and Apple Watch. If a POS system supports Apple Pay, when you're ready to check out, you can use your stored credit or debit card to pay with just a quick press of your fingerprint or the side button on your watch. Mac computers can use Apple Pay, too. Since the fingerprint reader is used for authentication, the App Store and many third-party apps let you pay for things using your Apple Pay information and your stored fingerprint. You don't need to verify the expiration date on your card, enter the security code, or do anything else since all the information is stored on your device. Apple keeps a list of all the different places that support Apple Pay. You might find Apple Pay support in restaurants, hotels, grocery stores, and more. Similar to Apple Pay is Samsung Pay, which works with Samsung Galaxy devices (full list of supported devices). In addition to storing up to 10 regular bank cards, Samsung Pay is partnered with tons of merchants so that you can store and pay with an unlimited number of gift cards.​ ​Android Pay is an app available on all non-rooted Android devices, ​available on Google Play.​​ Just place your phone near a Samsung Pay or Android Pay terminal to have the NFC reader communicate your payment details. Lots of banks let you transfer money to other users of that same bank. Sometimes this feature is available from within the mobile app. Bank of America, Simple, Wells Fargo, and Chase are just a few examples, but many others work the same way. These are actual banking apps that connect you to your account with that bank. You have to set up a savings or checking account in order to use them, after which you can use those accounts to send money or collect money from others. All four banks can do this through their mobile apps. If your bank doesn't support transferring money to someone else who uses your same bank, or they don't use the same bank but you still want to send money to them, you can use a nonbank app to make the mobile transfer. These are apps that aren't technically banks but do let you either pull money from your bank for mobile payments or keep cash in the app so that you can quickly transfer money to others who use the same app. The free Square Cash lets you send money directly to anybody's bank account without any fees. It's as simple as choosing an amount to send or request, and then sending it over email or text. You can store money in the app so that it can instantly go to the other person's account, after which they can keep the money there and use it for other transfers, or move the money to their bank. PayPal is another popular mobile payment service that works much like Square Cash, where you can send or request money from the app as well as store money in the account for instant transfers. You can even pay with your PayPal account in some stores. Mobile payments are offered by Google, too, through Google Wallet. Add money to your Google Wallet account in seconds and send it to anyone. All they have to do is put in their bank information to receive it. Choose a default payment method and Google will automatically transfer all incoming money into that bank. It's essentially a bank-to-bank transfer app, with Google mediating the details. American Express Serve is like these other services with the added benefit of using prepaid forms of payment and the ability to build sub-accounts. Snapchat and Facebook Messenger might not be your first thought when it comes to mobile payments, but both of those apps let you send money to your Snapchat or Facebook friends. It's as simple as putting the dollar amount in the text message, and then confirming your payment details. Some other mobile payment apps include Venmo, Popmoney, and Blockchain (which sends/receives Bitcoin). Square, the same company that runs the Cash service mentioned above, also lets you accept payments from cards through their free Square Reader device that attaches to a headphone jack. Money is processed through their POS system. PayPal has their own free card reader called PayPal Here, as does PayAnywhere. If you want transactions neatly organized with your QuickBooks account, you might prefer QuickBooks GoPayment. All of these services charge fees either per transaction or for a yearly or monthly cost, so make sure you look around in those links for the most up-to-date details. Probably of less interest to most people are direct carrier billing mobile payments. Sometimes when you buy an app or ringtone for your phone, the service will add the amount to your cell phone bill. This is a common practice when making donations, like to Red Cross. Closed-loop mobile payments occur when companies create their own type of mobile payment system, such as Walmart, Starbucks, Taco Bell, Subway, and Sonic. Each of these apps let you pay the bill from your phone, either ahead of time or when you pick up your order.